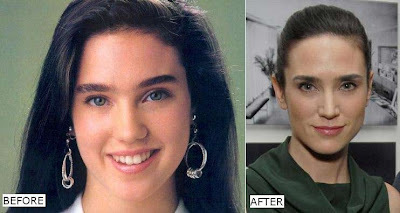 Recently after stumbling upon an older picture of Jennifer Connelly, the thought occurred to me "did she get a nose job? ", and have since been quite torn on the idea. Clearly her nose is drastically more defined and pointy as of today, but when you consider the before and after picture has roughly a 20 year age gap, it could just be natural growth, pretty extreme natural growth. I really want to hear some opinions from the cunning readers we have here at plastic celebrity surgery, so we can get to the bottom of this plastic surgery mystery. Either way, Jennifer Connelly is a real beauty in my book. It's hard to tell because she has become so anorexic these days. It looks to me that she's had some shaving done. Even with changes that come with aging I don't think a nose could change so drastically. Her current nose is smaller and shaped in a much nicer way. I can only imagine that she did have a nose job. She did not. She was famous as a child model for having that nose. You can't compare a photo where she is smiling vs. frowning. Go look in the mirror and smile. It widens your nose. And yes as you said there is a 20 year age difference between those photos. Trust me it makes a difference. She was early teens in that first pic, not even fully grown yet.